The Semi-Permanent eyelash extension course is a one-day training course which combines theory with the application of the lashes. Students will learn how to get the best finish from the lashes by blending the extensions with the client’s natural eyelashes, using a skilled technique. The result is natural looking eyelashes that are thicker and longer. Prepping the salon space and understanding health and safety. Completing the Chill Out Beauty Training Semi-Permanent eyelash extension course will result in a certificate from the Chill Out Beauty Training Academy. This certificate is proof that you are qualified for the treatment, and you can use it to begin practising on your clients. You do not need to have previous experience in semi-permanent eyelashes to embark on the course. The course runs for one day, so you’ll be asked to practice the treatment on a model to get the best level of experience. Standard therapist clothing or black top and trousers should be worn to the course. 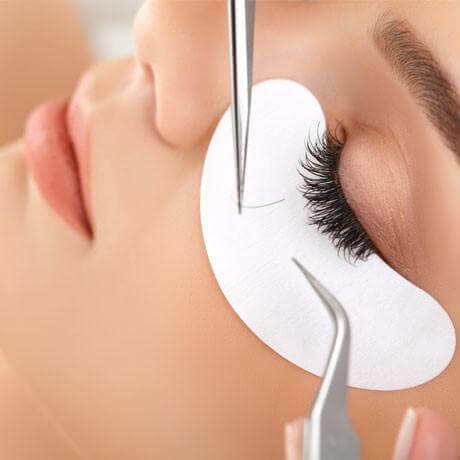 You’ll learn all about applying semi-permanent eyelashes, from the initial skin test which must be performed on clients to ensure that they are not allergic to the professional removal of the lashes. You’ll also learn about the health and safety requirements, and how to prepare your work area before the treatment. Lastly, you’ll learn how to advise your clients on aftercare following the application of semi-permanent eyelashes. £275 (£100 deposit required to secure your place). Refunds are not given unless you give a cancellation notice 7 days before the course is due to start. Or contact us directly via phone on 0151 548 7730 to find out more or make a booking. really hands on approach ! Friendly, well informed and hands on. I liked being able to watch a demo first and then practice on a model. Friendly tutor and atmosphere. Interesting and easy to learn. The tutor, how patient Rachel is. Practical and watching on a model. I liked how I could get involved, very practical. Rachel’s ability to explain everything in detail. Everything, tutor was very knowledgeable and patient. Really enjoyed this course. The kit and the practical aspect. Rachel was very friendly, explained everything very clearly and was very patient. Excellent course. Thank you. Practicing lashes on my model. The practical side of the course.